As you can see from the above matrix even if you loose your key or forget your key code you still have another 2 options to enter your home. In addition you have the added security of triple deadbolts. This compares favourably to the standard option! Once you loose your key and unless you have a spare handy you’ll need to ring a locksmith. KEYless Entry Systems locks and home security go hand in hand. Home security is something we all take very seriously, it involves us taking precautions to ensure our loved ones sleep soundly at night and our most treasured belongings are protected. Over 200,000 burglaries occur in Australia  every year and the access point for the vast majority is through a door or window. Entry via a door can be as simple as a couple of solid kicks when a standard deadlock is fitted. How can we make the door harder to penetrate? With the use of a combination of a heavy duty door and of course a good door lock and dead bolt plus the added security of a security screen door (which nearly even second house has already), this should hinder the unwanted entry of most undesirable characters. However the locks are only good if they are installed correctly. For example short screws and soft wood will make even the best dead lock ineffective so if you are unsure consult a locksmith. Finally our locks at KEYless Entry Systems have locking triggers which provide extra strength points; this makes it even harder for thieves to lever the mortise out of position. Combination unlocking options require the entry of both a pin code and your fingerprint for the lock handle and the deadbolts to be deactivated and allow entry into your dwelling. For a little extra peace of mind internal deadbolts stops entry from the outside regardless of if you have a code or have fingerprint access. The image below is a great example of a secure mortise. 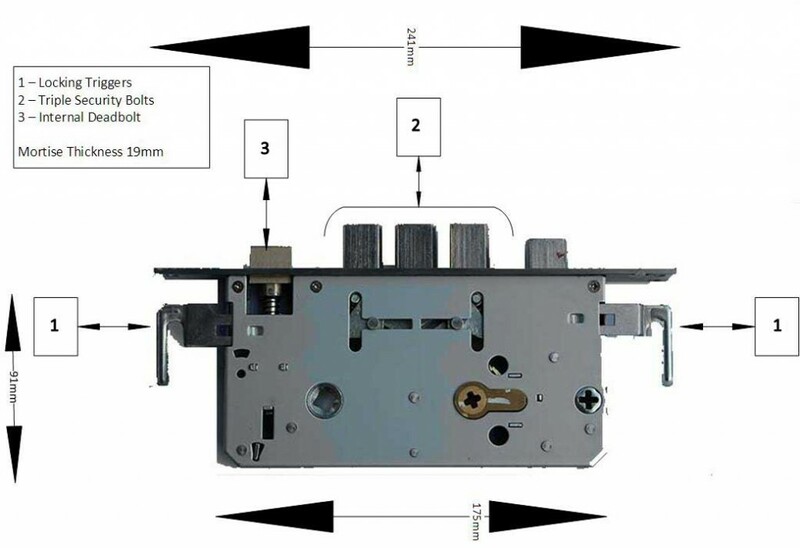 At KEYless Entry Systems we have a number of mortise options for our biometric fingerprint lock range and this is one of them. As you can see triple deadbolts will offer superior strength. The force of any impact is spread over a larger surface. The locking triggers can give you greater resistance to levering. If you want to restrict all access externally simply activate the internal deadbolt and as a result entry from the outside will be impossible. Gone are the days of having separate keys for the door handle and the deadlock. Furthermore these keyless entry biometric fingerprint locks will fulfil your needs in one handy package.